A guide and preview to Scum and Villainy, the newest operation released with patch 2.0. This operation features 7 bosses and is much more lengthy than previous operations. Included are guides for both storymode and hardmode. These are cutscenes that give background on the operation. This loot list is for 8m, double the armor pieces for 16m. Black Market and Arkanian are both Level 55 gear with the same rating of 162 containing L69 mods. Black Market gear does not contain any set bonus. Underworld and Verpine are both Level 55 gear with same rating of 168 containing L72 mods. Verpine gear does not contain any set bonus. Elite Commendations is used to acquire Black Market gear. There is a weekly cap of 200 with a storage cap of 400. Ultimate Commendation is used to acquire Verpine gear. There is a weekly cap of 150 with a storage cap of 300. You will encounter these guys right after Dash’roode. Pirate Stimfiend will buff all the mobs around him, increasing their damage output. Med-Tech droids on the other hand, will continously heal other mobs until killed. Priority is to kill the Med-The Droids and then Pirate Stimfiends ASAP. Dustclaw Alpha have an ability called Commanding Shriek that needs to be interrupted. These guys have two attacks. First is Free Sample which is a mortar volley like attack that deals AoE damage to a small area marked by a yellow circle. If you take too long to kill Arms Trader or he gets low in health, he will use an ability called Final Offer that deals a ton of single target damage. Most of them are interruptible. Looking forward to tackling this one! The Fourth and Fifth lockouts are probably my favorite in all of TOR. Found the level 10 exotic crafting material, “Exotic Element Equalizer” from a pull on the left before the 4th boss. Champ who drops it is named Accomplished Arms Trader. Credit goes to Sithit’s raid team. Accomplished Arms trader was harder than any of the first 4 bosses for us in HM. He has a reflect shield that you have to watch for. It is a buff that looks like the Sorc’s bubble. When he puts that up you have to stop attacking. We wiped a couple times to this, and after hearing the sound which usually indicates reflect damage we noticed the shield. I haven’t noticed this being mentioned elsewhere, so hopefully that helps. What is the gear requirement for this Op? I’d like to know this as well, is the “Basic” gear a requirement for SM S&V? Also I’d like to know gear requirements for the new level 55 HM FPs. I’m full Dread Guard and I was wondering how that level of gear stacks up vis-a-vis SM S&V? So can you RE and learn the new 69 gear? Meaning mods/enhancements/armorings. How? lol, I never even had 1 mil and in Sm or hm? 8man Hardmode Loot is one token + one random Verpine piece. Boss 6 and 7 drop 2 random Verpine pieces. I’m not sure how much commendations we got. I have got 59 Ultimate commendations. We cleared hardmode only one time until now and did the weekly mission. Just to clarify, those are underworld tokens right? Took us about 3-4 hrs on storymode. That is knowing about 5/7 of the boss fights. It took us 2h30 with no knowledge of the fights (I asked my people to not look at strats). We wiped once on the Operation Chief, on the puzzle boss and on the last boss and once on trash (/facepalm). Thanks for the info! Good stuff! I checked one of my video files of dread master styrak. we got 6 ultimate commendations in 8man hardmode when we killed him. 16man Hardmode 5th Boss: 8 Ultimate Comms. The loot is doubled as usual. Dulfy, do we know what TFB SM and HM are dropping? I’m assuming both have been scaled up to be the same level as S&V now…right? Ran TFB SM in a pug to Operator last night, seems to be mainly Black Market and Elite comms. Accompished Arms Trader 16man hm: 2 Elite Comms. No Ultimate Comms. Does this operation have a Nightmare mode ? Do the boots, offhand, and head drop of tfb? DOes anyobdy know what Golden Fury is? It is listed as a SM Operation in the new Elder Game Guide. Just want to point out that there is a third Accomplished Arms Trader that is actually in Oasis City. Along the main path to the left there is a large circular building (near the Green team). You can go back after killing the Operations Chief to kill him. Drops the same as the other two. Confirmed, we took it. Another Acomplished Arms Trader for 2 more equalizers and a total of 3 in this OP. the 16 man story mode for both lvl 55 operations give 4 Ultimate Commendations per boss. So 20 for TFB and 28 for S&V before the weeklies. Not sure if you are aware but there is a third accomplished arms trader inside the Oasis City in one of the buildings. Well written guide, helped us a lot. But to be honest, we have more problems with the mobs between bosses, then with the bosses itself. Especially with the Acomplished armstrader. I think we never beated the guy without wiping on him once. Do you have any strategies how to approach that fight? 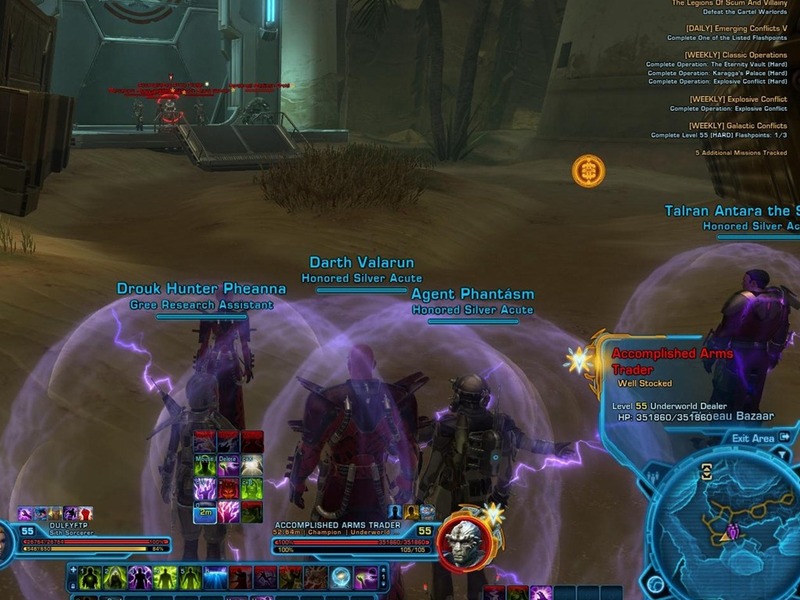 We tried ignoring the adds after we kill the medtech droid and stimfiend, so we can kill him. 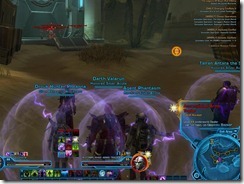 And we tried leaving him last, leting him enrage so he wouldnt cast his reflecitve shield. But then, he one shot kills anybody, who is not a tank. Do you have any tips how to deal with those pescy Acomplished Armstraders? only when both tanks and both healer get portet. 1) I am playing an Guardian and i have avarage ~730 DPS throught the fight. Is that enought? 2) Should i exchange some of my deffstats to offensive stats like power or ap? 3) Or shoud i go for accuracy? I know this is 9 moths late… but maye you could replace a few armor pieces with main stat > Endurance since Endurance isn’t as important as Defense, Absorption and Shield. How is the HM operation different in 4.0 now? Still the same?